Title text: Then we move to phase two. Gas stations store fuel in underground tanks. Normally, these are inaccessible except via the pump. However, with hydraulic fracturing, we-- Wait! Come back! In this comic, Cueball announces he has "an exciting business opportunity to share". After hearing discouragement from his off-panel audience, he promises that "this time it's a good one", and goes on to explain his plan. Cueball's plan involves the premise that a small amount of premium gas is left in a fuel pump hose after a car driver fills their car up with premium gas. He states that even if the next customer only pays for regular gas, that they are still getting a small amount of the expensive premium gas. Though he doesn't get a chance to finish the outline for his plan, one can assume he planned to get premium fuel at regular prices, so he could then sell it for profit. After hearing the first part of his plan, two people from the off-panel audience announce they are leaving, clearly and correctly thinking that Cueball's idea is stupid and impractical. In reality, this would be an impossible business venture to execute. While in the United States often the same hose is used for the various octane fuels, the amount of fuel contained in the hose is relatively small (about a third of a gallon, or half a liter) compared to the amount that is generally purchased, though for motorcycles the ratio is more significant. It is also illegal to resell fuel without the correct licenses, and it would be difficult, bordering on impossible, to have the fuel pump run to just the premium fuel out, and driving to each gas station would use more money to buy more fuel than any money that could be made back. This is not to mention trying to keep track of when someone purchased premium so as to be the next person to use that pump to extract those precious drops. 1499: Arbitrage implies a similar plan to extract wealth out of a small market inefficiency that, in reality, would be far too onerous to exploit, in this case reselling the free chips offered at some restaurants. The same idea was also used in 1110: Click and Drag where a person takes free drinks to resell. See also the what if? Cost of Pennies regarding why it would not be worth trying these kind of ventures out. The title text is another one of Cueball's fuel-based business ventures, as he says he plans to dig up fuel stations underground fuel storage tanks, to then sell the contents of. Again, illegal/theft, impractical, don't try it (though it would be much more profitable than his previous plan). The punchline is that a gas station's underground tank is "inaccessible" from the outside, just as there are some oil deposits that are inaccessible to traditional oil production techniques because no sufficient natural flow towards a well can be obtained. In the case of oil deposits, high-pressure fluids are pumped into the rock to break it up ("Hydraulic fracturing" also known as "fracking") and allow the oil to reach the well. Oil tanks, on the other hand, can be made accessible by puncturing them using (presumably) hydraulically powered tools (electrical power is inadvisable in the presence of high-vapor-pressure hydrocarbons due to the significant risk of fire and explosion caused by electrical sparking). The title text of 1662: Jack and Jill also refers to fracking. This comic originally shared name with 827: Business Idea, which was then renamed. There were no other relations between the ideas for the two comics, see Trivia. Cueball: Thank you all for coming. Cueball: I have an exciting business opportunity to share. Off-panel voice #1: Oh no. Off-panel voice #2: Your ideas are always the worst. Cueball: No, no, this time it's a good one! I promise. Off-panel voice #3: I'm leaving. Off-panel voice #4: Me too. Because this comic had the same title (and filename) as comic 827: Business Idea, Randall inadvertently broke both xkcd.com and explainxkcd.com when it went up. The main xkcd.com site showed this comic for both numbers, while explainxkcd.com showed 827 for both. 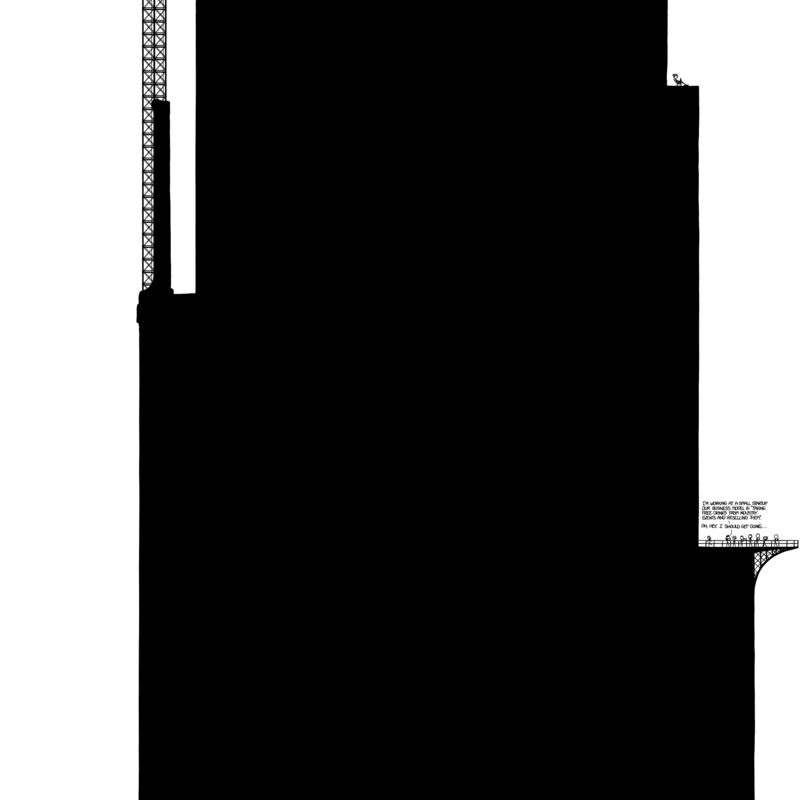 As of 11:35am UTC Randall has fixed this by renaming the old comic to 827: My Business Idea, which has now been implemented also here on explain xkcd. This is the third time Randall has released a comic with a name exactly the same as a previous comic. This is the second time the xkcd site broke. See more under Comics sharing name. Not all gas stations leave the fuel in the hose; many pump it back into the tank for storage. He accidentally named TWO comics "Business Idea". This one and comic 827 (https://xkcd.com/827/). 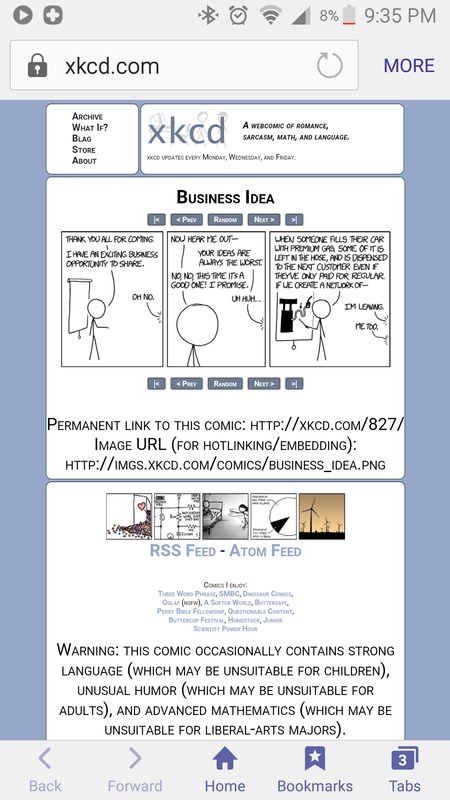 Because his comics are stored by name, not id, he has two "business_idea.png"s. The newer replaced the older one, but explain-xkcd has the original, probably due to the way either one is stored. The point of Elektrizitätswerk is the most important in Germany. We have very strict laws concerning precision of amount/quality of sale. This is actually about Starbucks, where customers - depending on the place, of course, as I've never seen it in Switzerland - are asked to pay some bucks for the next customer. You are expected to pay something "forward". Knowing about the oil industry myself and how oil is transported... different qualities of oil are separated by having different densities, however, some mixture where the two products are touching is unavoidable. This is relevant because the non-premium gas actually has a certain amount of premium mixed in, and that's why the octane rating is a minimum. This page was last edited on 2 March 2017, at 06:05.